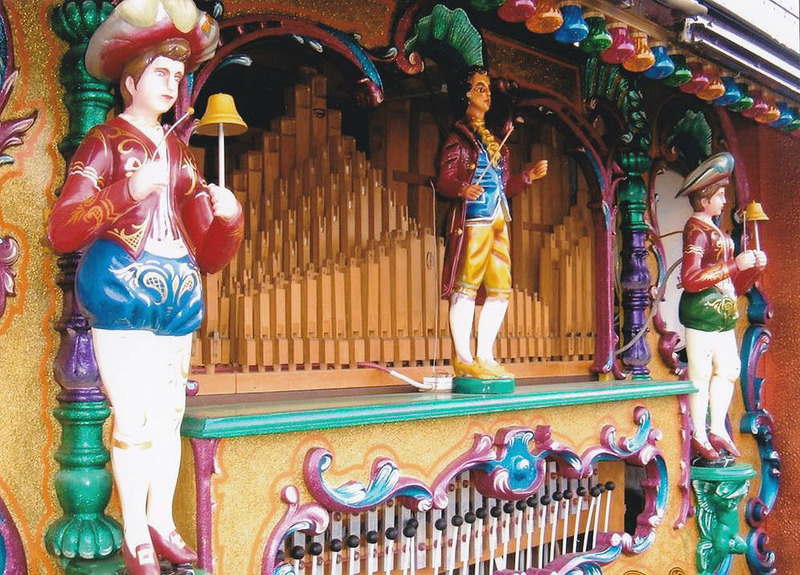 We are pleased to be able to offer this genuine Dutch street organ which has a long and varied history, the earlier part of which is recorded in the authoritative Dutch book “Glorieuze Orgeldagen” (“Glorious Organ Days”) by Frans Wieffering, published in 1965. 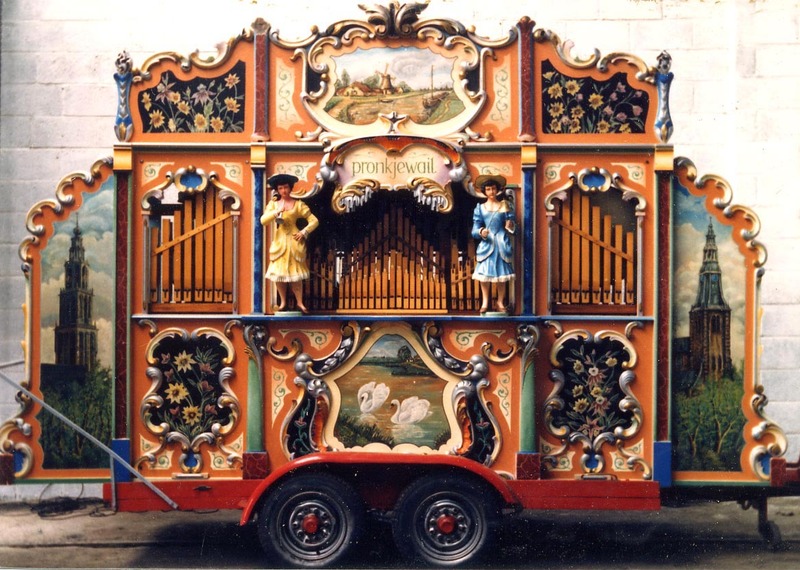 Here, its origins are stated as being a barrel organ built by the German firm of Richter Bros. in Düsseldorf. In 1910 it was owned by a certain Wesker, who ran an organ rental business in Amsterdam. In common with many old-fashioned barrel organs, the Richter was later sent to the Limonaire factory in Paris and was heavily rebuilt in their style and converted into a 46-key cardboard book-playing organ with registers for vox humana and clarinet. Wieffering tells us that Wesker sold the organ in about 1913 to Gijs Perlee snr., another well-known character in the Amsterdam organ world. He, in turn, sold it on to Mr Schuurmann, a travelling showman from Alkmaar, who used it with a set of swing boats. It was later used on the fairs in the south of the Netherlands, and during this time it was again rebuilt by the van Steenput firm in Puurs, Belgium. 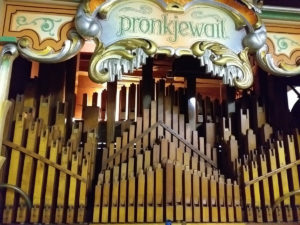 After several other changes of ownership, the organ was acquired in a very poor, worn out condition in 1968 by an organ enthusiast in Groningen, a northern Dutch town. In his spare time he restored the organ and made further changes to it. When completed, he played it on the streets there as his hobby from 1977 onwards; the side wings are decorated with paintings of the Groningen churches. He also gave the organ its present name “Het Pronkjewail” (“The Pretty One”). In about 1980 the organ passed to organ builder Anton Pluer, who, after overhauling it and replacing some old pipework with new, loaned it for a period to the Kunkels Organ Museum in Haarlem. In August 1984 it was purchased by a British enthusiast who brought the instrument over to this country. Not long after, in early 1985, our company [A C Pilmer] fitted the electric drive motor (still in use) and produced the first of a series of cassette tape recordings which were sold when the organ appeared at public events. The organ last changed hands in September 1988. The new owner increased the repertoire of music books to over 400, representing an extremely long playing-time, with music of all types by well-known Dutch arrangers. Contact us if you have interest in this instrument. It is currently mounted on a trailer and is ideal for street collections, outdoor shows, promotions, etc. 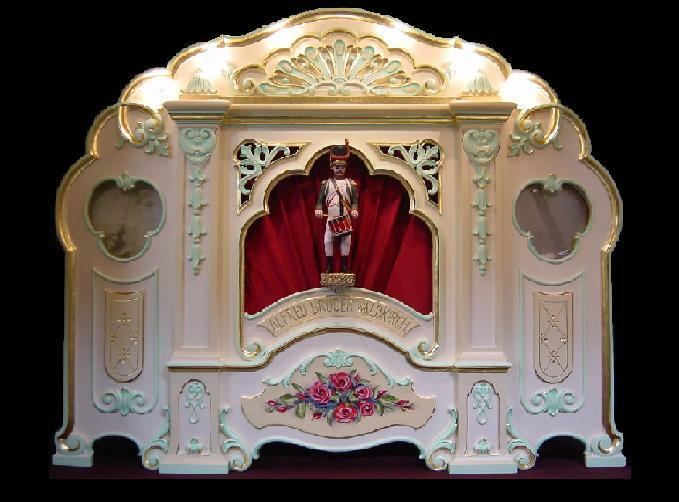 Please note that our photograph does not show the central bandmaster figure, which is included in the sale. This is an impressive modern organ with 14 automatic registers and three animated figures. In good playing order, there is a large repertoire of popular music by several well-known arrangers. Wind is supplied by a centrifugal blower and there is the usual percussion. Some of the music is on separate books, but there are also a number of large, endless music hoppers permitting a continuous performance without an operator. 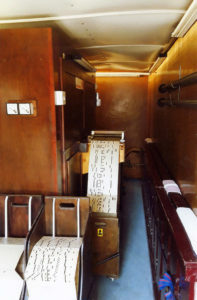 The organ is built into a special display vehicle but the organ can be purchased without this vehicle if required. The registers include: bourdon, violin, piston, flute, glockenspiel, tremulant, céleste, cello, saxophone, cello grave and trombone. The scale offers greater possibilities due to the inclusion of a 12-note counter-melody division. This organ is in good order and is ready to be put to work. It is ideal for exhibition at rallies and shows or for commercial use in an amusement park or similar. We will be pleased to provide additional information to prospective purchasers on request. The owner of this organ is about to lose his storage and is willing to lower the price for a quick sale. Don’t miss this opportunity. Contact us now for further information. De Arend II with 12 automatic registers and 101 keys. Built in the Netherlands in the early 1990s. Plays from both cardboard music books and computer Midi files (about 50 tunes on each system). It is currently mounted on a close-coupled trailer suitable for towing behind a four-wheel drive vehicle or van. Further details can be obtained on application. 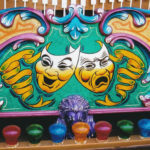 Here is an opportunity to begin a large, brand-new mechanical organ! We have for sale a very solidly constructed organ case, veneered inside and out, with traditional-style removable and sliding back panels at the rear, together with four side cases, painted inside and out. Also available is a brand new set of triple-acting bellows and reservoir of large proportions, suitable for blowing a very large instrument, complete with newly-fabricated crankshaft. This assembly is fully finished and professionally leathered, but is as yet without springs. A complete but unfinished new keyframe of 112 keys is also available. All of these items have been made to a high standard by a well-known and respected organ firm. These parts would form the basis of an impressive new concert organ or large fairground organ. You could do this work yourself, or we would be pleased to discuss building a new organ to your requirements. Further details, dimensions, etc. furnished on request to serious enquirers. 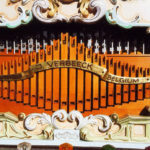 This instrument was built in 1982 by Johnny Verbeeck in Belgium. The specification includes melody registers for bourdon céleste (2 ranks), violin (3 ranks), trumpet, glockenspiel and tremulant. The accompaniment has three ranks, plus a rank of trumpets which can be added in forte passages in the music. There are 8 bass notes which have two pipes per note plus 4 extra cello bass pipes. A rank of trombones can be added to the basses under register control. The percussion comprises: bass drum and cymbal, snare drum and wood block. The front has three figures, a bandmaster and two bell ringers. The accompaniment forte and cello bass pipes are were an optional extra to the usual production models of this type. In 1999 a MIDI playing system was installed and there is about 5 hours of music included on floppy disc. Whilst the keyframe is still attached to the organ for playing cardboard music books, none are included in the sale, as all the books were disposed of when the organ was changed to computer operation. At present the organ operates on 110V DC, but a 230V AC mains transformer / rectifier is included for use on the normal mains supply, which is required in conjunction with the MIDI system. We will be pleased to furnish further details on this organ on request. 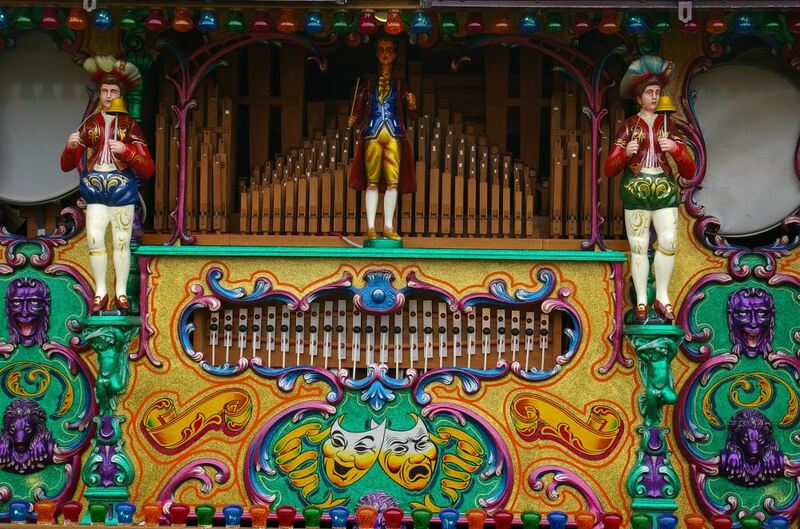 The organ would be ideal for use by a travelling showman or permanent amusement park. 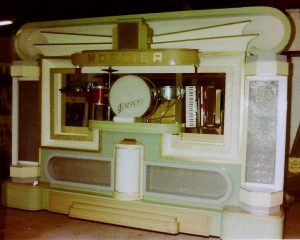 This organ was built in the 1950s as a “half-electronic” organ; the bass and accompaniment notes were furnished by real organ pipes, but the melody and counter-melody divisions of the scale were created by an early electronic instrument which was the forerunner of the later synthesizers. These new sounds gave café organs a new lease of life, as these same new electronic tones could regularly be heard in contemporary pop tunes. This particular organ was used commercially into the 1970s and was later modernised and converted to the Gebr. Decap scale, to take advantage of Albert Decap’s excellent arrangements. It came to England in the late 1970s and had several owners. Sadly the intervening years have not been kind to the instrument and it is therefore our intention to rebuild it as a full-pipe organ on the 92 key Gebr. Decap scale, retaining as many of the existing parts as possible. The large, illuminated façade will be repaired and redecorated in authentic style, with airbrush detailing. At present the organ has a single Frontalini accordion, one of our personal favourite makes, but at this stage it would be possible to enlarge to two accordions if required. 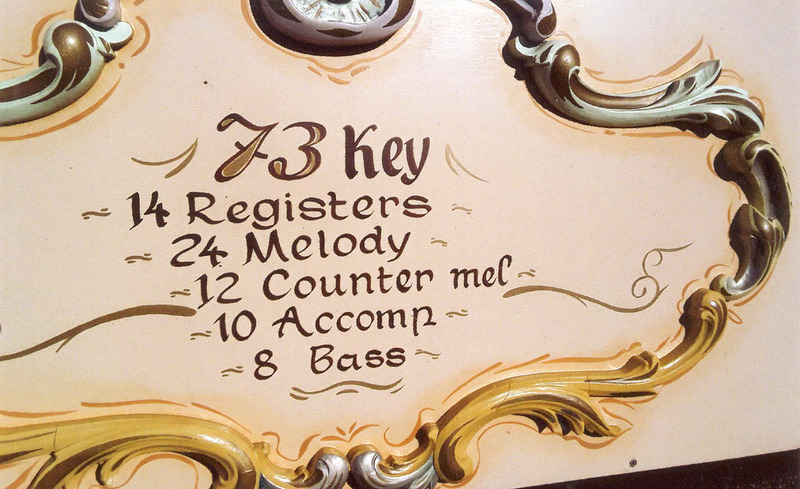 92-key all-pipe café organs are today hard to find and are much sought after, so this is your chance to obtain such an organ, customised to your own requirements. We recommend you contact us soon for further details. This instrument will be suitable for private or commercial use. 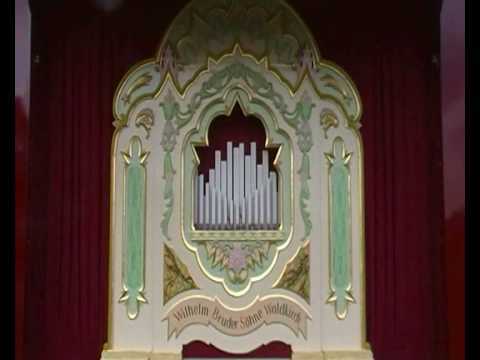 This is a unique opportunity to acquire an example of the largest and most impressive type of all-pipe dance organs. 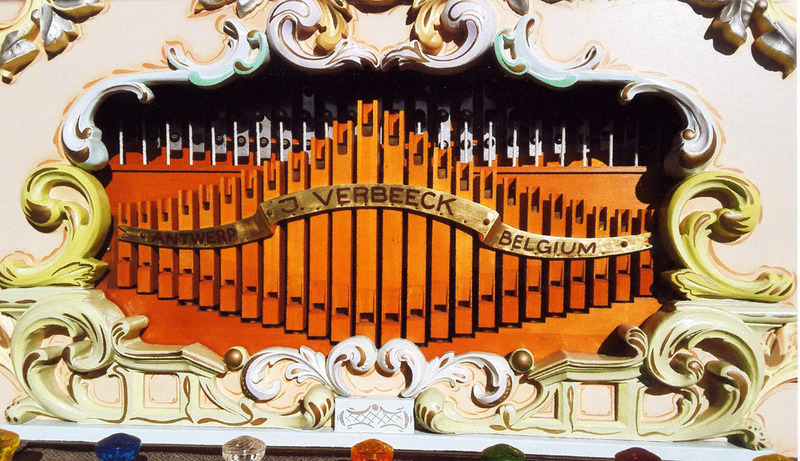 121-key Decap Antwerp organs are generally regarded as representing the pinnacle of Belgian dance organ development, with a comprehensive fully chromatic musical scale and wide range of musical possibilities. The whole ensemble is completed by an extensive visible percussion section. A large and varied library of music is available, the work of the best arrangers for this type of instrument. We will be pleased to discuss this with anyone seriously interested in owning such an organ, whether for private or commercial use. These organs do not come onto the open market very often, and this one offers exciting possibilities. 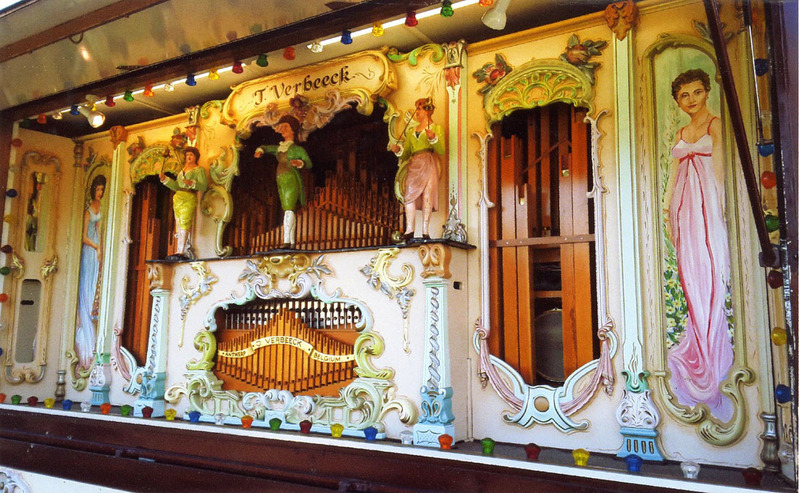 This instrument was built in Waldkirch in 1927 and is a fine example of a small German fair organ with a big heart. It is in excellent condition and is regularly maintained and tuned by us – a few years ago we also completely restored and re-decorated the façade. It comes with 14 boxes of cardboard music (each one is nominally 100m length) plus a number of individual books. The repertory encompasses many different types of music and includes outstanding arrangements by Carl Frei, Gustav Bruder and others. The façade was stripped, repaired and completely repainted. (Click on images to enlarge). The scale of this organ has 8 bass notes (plus 5 trombones on separate register control); 11 accompaniment notes (strengthened by trumpets under register control) and 22 melody notes. The melody division has three ranks of violins in constant play, and adds two further ranks to these, an octave and super octave under register control. There is also a snare drum and a bass drum and cymbal. This is nominally the same scale as 52 key Limonaire, a firm with which Alfred Bruder’s father, Richard, had close connections as Director of their branch in Waldkirch. This excellent scale makes 46 keyless Alfred Bruder organs one of the most versatile small German fair organ types in existence and as such are able to play with great conviction, without the need to make obvious compromises due to missing semitones in the scale or limited bass notes, as is very often the case with small German fair organs. We can furnish further details of this organ on request, and will be pleased to make arrangements for serious intending purchasers to view it. 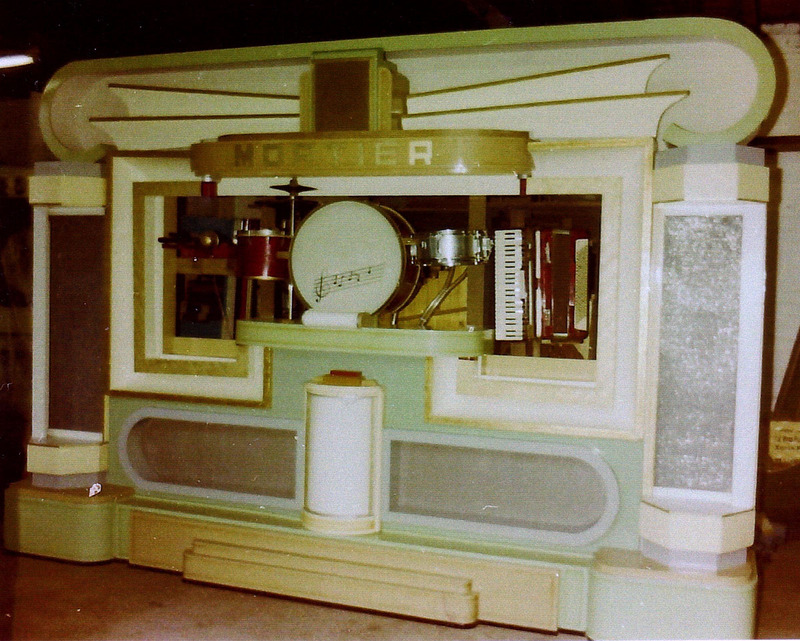 This organ was built in about 1970 by Arthur Bursens, of Hoboken, Antwerp, Belgium, as part of a batch of four. This particular one was bought by Lord O’Neill and became an attraction at Shane’s Castle in County Antrim, mounted on a 1920’s Leyland lorry. Later, it was sold to Arthur Mason in Norfolk, and in 1981 passed to John Harrison of Pontefract. We extended the façade and built a proscenium, which the organ had always lacked. Much new music was supplied at the time, and the organ was extensively exhibited. 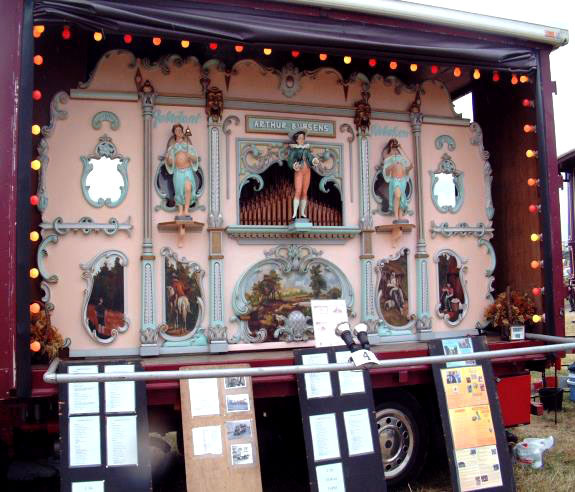 The organ changed hands again before being acquired by A C Pilmer Automatic Music Ltd. and mounted in a newly-converted Bedford display vehicle. 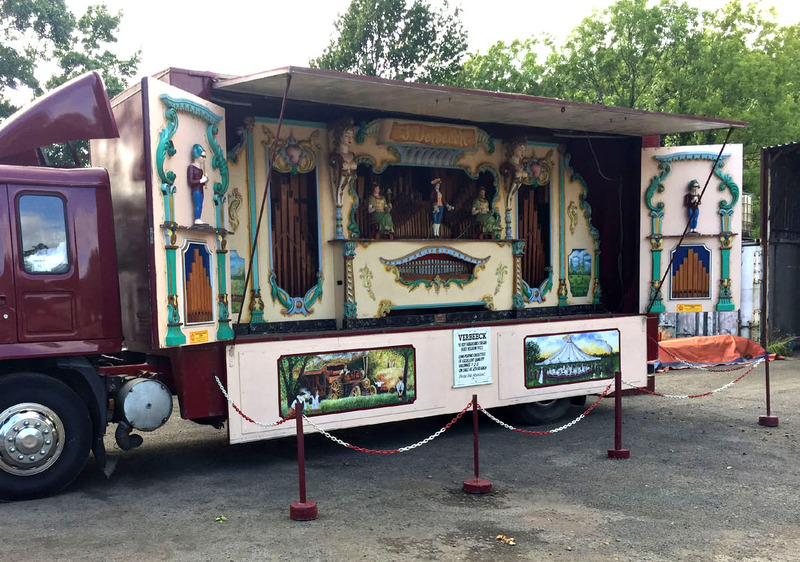 In this guise it was frequently rented out and spent time on hire at Lightwater Valley Theme Park in North Yorkshire, as well as attending many public events in the north of the country. In 1990 the organ was acquired by the present owner who has had much pleasure with it, but has now decided the time has come to let someone else enjoy it. The organ plays a special Bursens scale, not the standard 52 key (Limonaire) scale. The organ operates with bellows and is a high-quality instrument. Mr Bursens died in 1982, marking the definitive end of the Bursens family’s organ building activities. 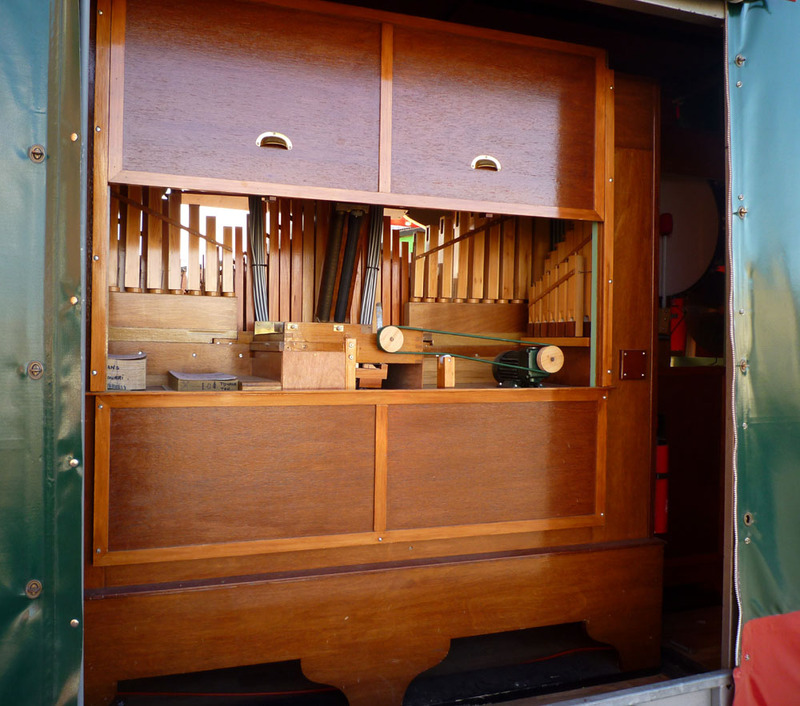 The organ is still mounted in the Bedford display vehicle and is ready for use. 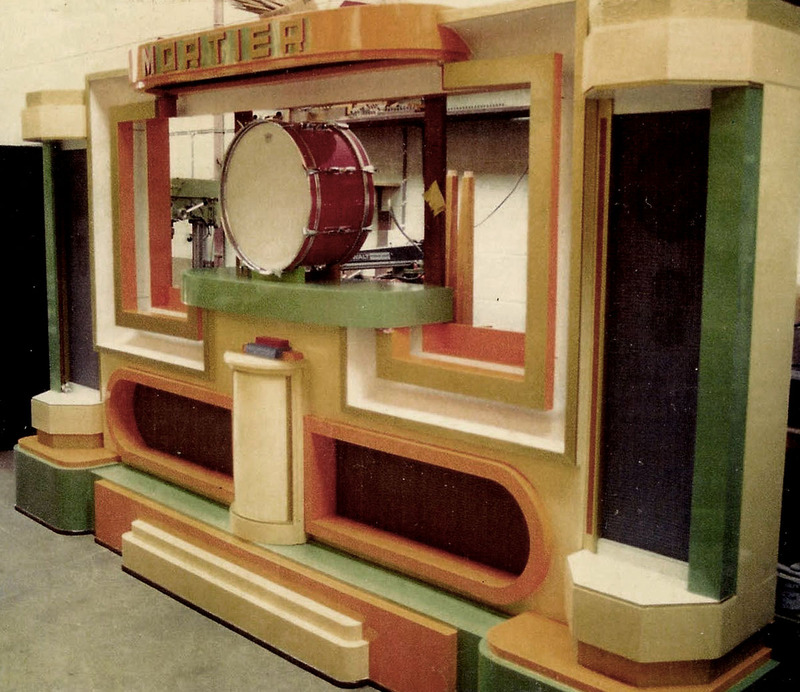 This large and impressive fully-chromatic fair organ was built by Gebroeders Decap in Antwerp around 1947 and initially travelled the fairs in Belgium with a Dodg’em track. Its imposing presence earned it the nickname “De Geweldenaar” and it became well-known both in Belgium and the Netherlands. In 1981-2 it was restored by J. Verbeeck and purchased by an enthusiast in the UK, where it made its debut at the Carrington Park rally. As part of the work, a brand new façade was made and fitted incorporating a bandmaster and two seated bell ringer figures. It attended many major events including the Manchester Organ Festival and the Great Dorset Steam Fair, changing hands later in the 1980s. After two more owners, it is now being offered for sale. It is still mounted in a custom-bodied display vehicle for public exhibition, and included is a large repertoire of music to suit all tastes, giving several hours playing time. The music books are all in good condition; the arrangements originate from Tom Meijer, Jan-Kees de Ruijter, Johan Weima and others. 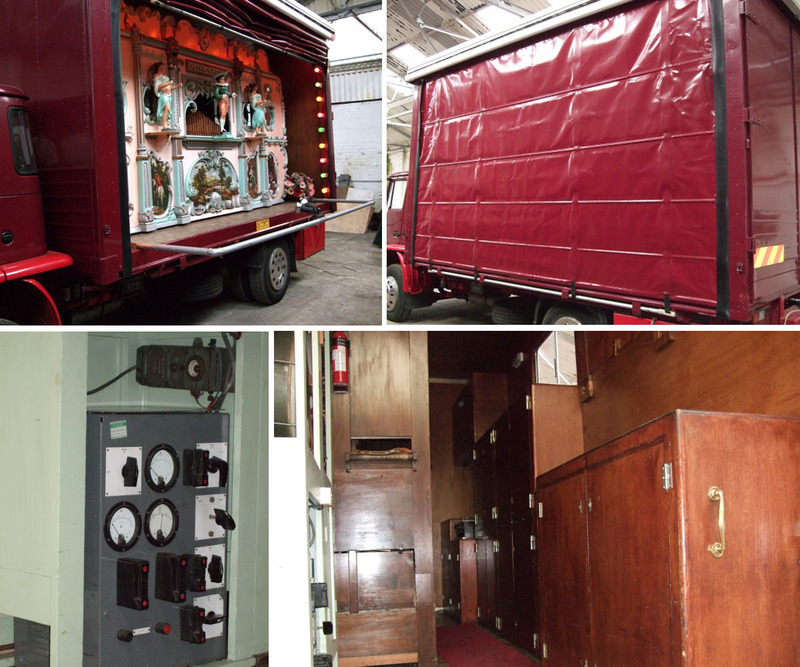 The organ is equipped to operate from a 110V DC supply (such as from a showman’s road locomotive) or, via a built-in transformer / rectifier unit, from a 240V AC supply, directly from the mains, or a portable generator. 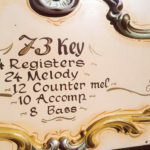 The organ includes automatic registers for: violin piano, violin forte, flute, piston (trumpet), glockenspiel, tremulant, saxophone, bassoon, cello, céleste, 2 x trombone, forte, etc. 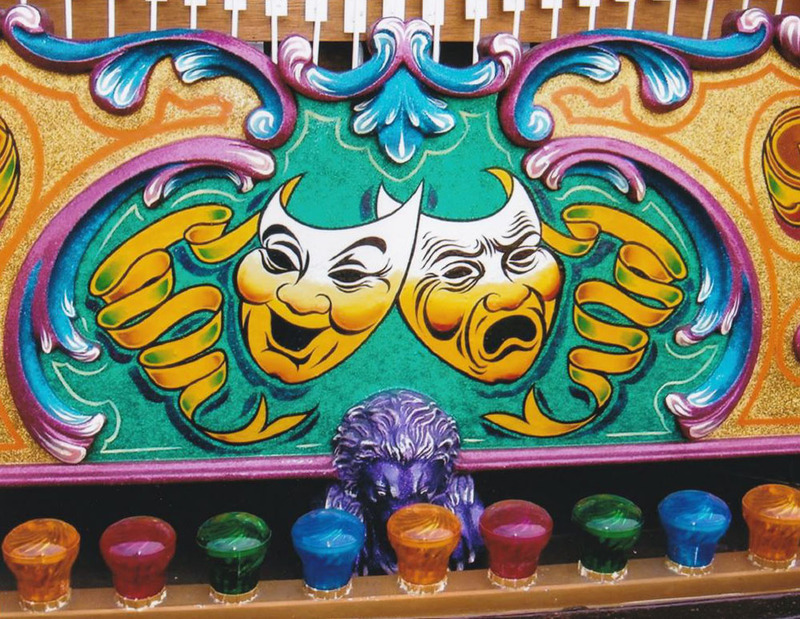 This instrument would equally suit an amusement park, showman or enthusiast – contact us for more information, dimensions, photos etc. 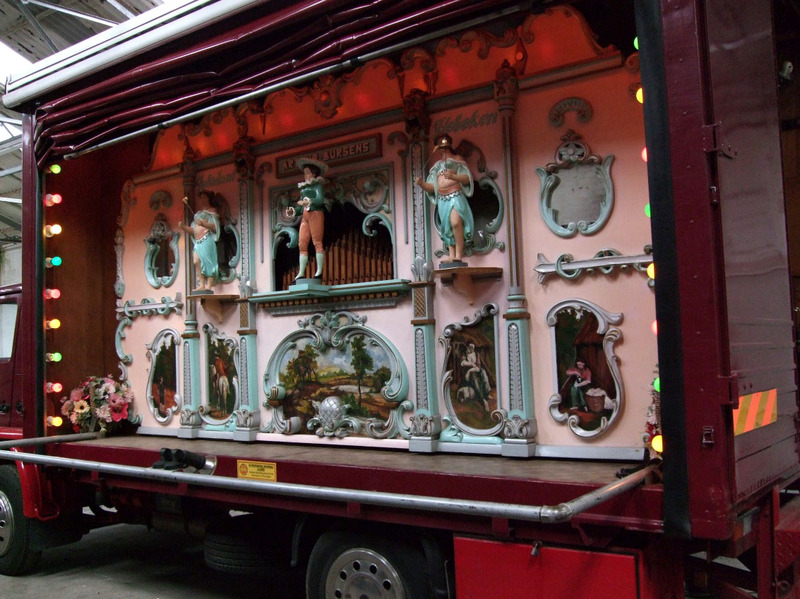 Please note: a proscenium is included with the organ but cannot be incorporated in the present vehicle due to height restrictions, hence it does not appear in the photograph. With full percussion, saxophone, trumpet, two accordions and xylophone on view. Also contains real jazz flute and vibratone pipes. Further details on request. Fully restored by us some years back, but still in excellent condition, with 600m of newly-cut music in boxes, much of it arranged by the renowned Gustav Bruder! Façade fully restored and re-decorated, including gilding. 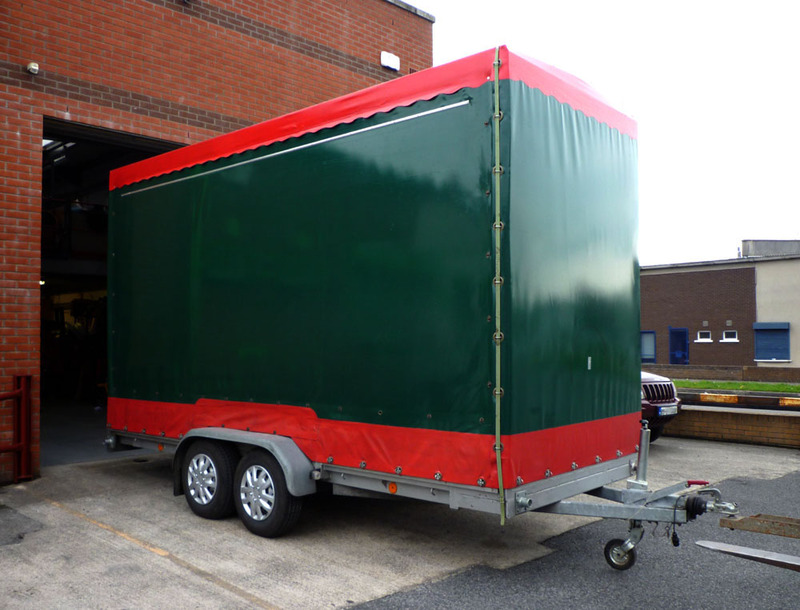 Available with or without custom-built close-coupled custom built display trailer. Ask for further details. (Click to enlarge). Hear the organ play ‘Blaze Away’ arranged by A C Pilmer. Mainly by Chiappa Ltd. Increase your existing music library, or would be great to get you going on a self-build project. We also have a few used 46 / 48 KEYED music books for sale. Contact us for a list of titles. 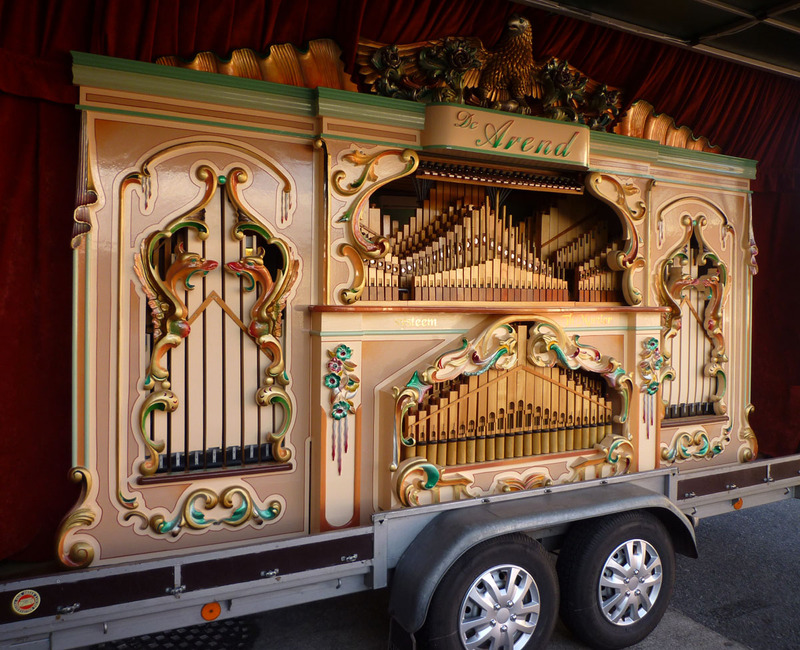 made by the Berni Organ Company of New York. Made by the B. A. B. Organ Company of New York. A number of original red manila music rolls in excellent condition in wooden holders for an Imhof & Mukle piano orchestrion type “Dinorah”. More details on request. Figures are available for sale from time to time. For those building new organs we can also supply good copies of original figures, and we will be pleased to furnish details on request. Contact us here.